Sirdar Americana DK yarn is a cotton rich DK knitting yarn in a range of summery mixed colours with a down home country style. 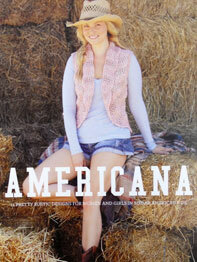 Americana is a blend of 60% cotton and 40% acrylic and machine washable at 40' (do not iron). 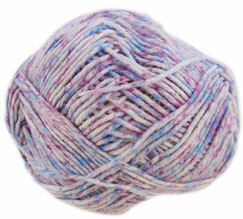 Sirdar Americana DK knits to a standard DK tension of 22st to 28 rows over 10cm on 4mm needles. 135m, 148yds per 50g ball. Sirdar Americana DK Dixie, 200. 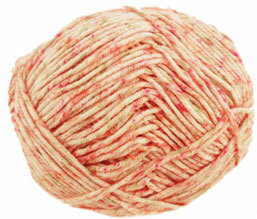 Summery cotton-rich blend, knits to a standard DK tension. 50g / 135m per ball. Sirdar Americana DK San Fran, 201. 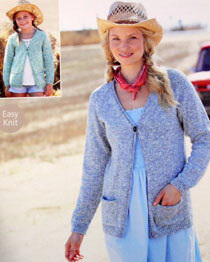 Summery cotton-rich blend, knits to a standard DK tension. 50g / 135m per ball. Collection of 14 designs for women and girls shown in Sirdar Americana DK - includes larger sizes to 137cm (54in) (size varies with design. Includes pattern leaflets 9769 - 9776. 20 pages plus photos. 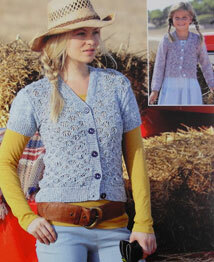 V neck cardigan with long or short sleeves in wave lace stretch st, shown in Sirdar Americana DK. To fit women and girls 61-117cm (24-46in). 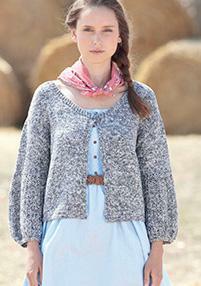 Easy raglan hip-length cardigan with rolled edging shown in Sirdar American DK. To fit girls and women 61-117cm (24-46in).